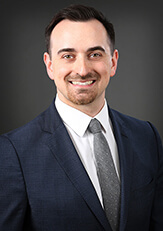 Brad Hutter, an Associate in the Litigation and Bankruptcy & Insolvency practice groups, is an advocate and an advisor for his clients. He represents businesses in commercial disputes, bankruptcy cases, and related litigation. Brad prioritizes open communication in his relationships with clients. When guiding a client through litigation, he takes the time to ask the right questions and patiently listens to understand his client’s perspective. Brad then translates his client’s concerns into clear and credible legal arguments. Prior to joining FMJ, Brad was an Assistant Attorney General in the Office of the Minnesota Attorney General, where he handled health care, licensing, and constitutional litigation. Following law school, Brad was a litigation associate at a law firm outside of St. Paul, where he represented business and municipal clients. Brad lives in southwest Minneapolis with his wife and their three kids. On Sunday afternoons in the summer, they can be found taking in concerts at the Lake Harriet Bandshell. Brad also enjoys following NBA basketball, reading, and serving at his church.